Maybe it’s the cooler days – or maybe it’s the golden glow of farm fields after harvest. All I know is, I’m really drawn to landscape oil paintings lately. 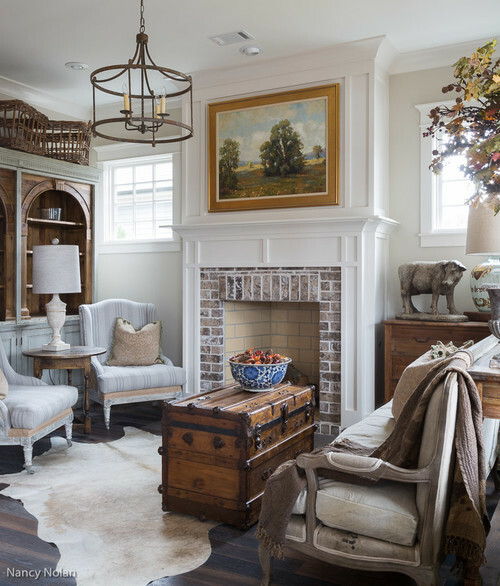 Here’s 14 inspirational rooms that have used a landscape painting to decorate the room. 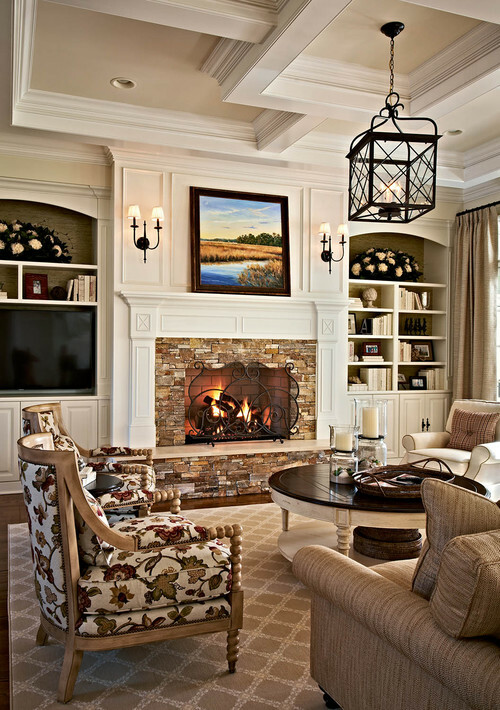 A warm living room uses a peaceful scene atop the fireplace mantel. Note how the red of the tree in the oil painting in the room beyond matches the red of the fireplace brick. I don’t know if that was intentional, but it’s a great way to tie the two rooms together. 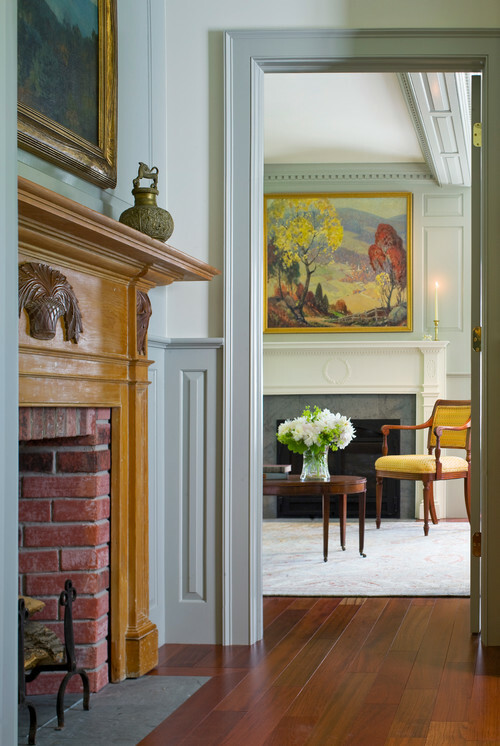 Not to mention, both fireplace mantels are gorgeous. The large canvas landscape painting mimics the colors in this beautiful dining room, pulling the room together. Here’s my favorite living room from a home tour I featured a while back. This room became the inspiration for changing things up in my own home recently. Like other homes, it features a pretty landscape painting above the fireplace, adding a touch of color to the neutral decor. 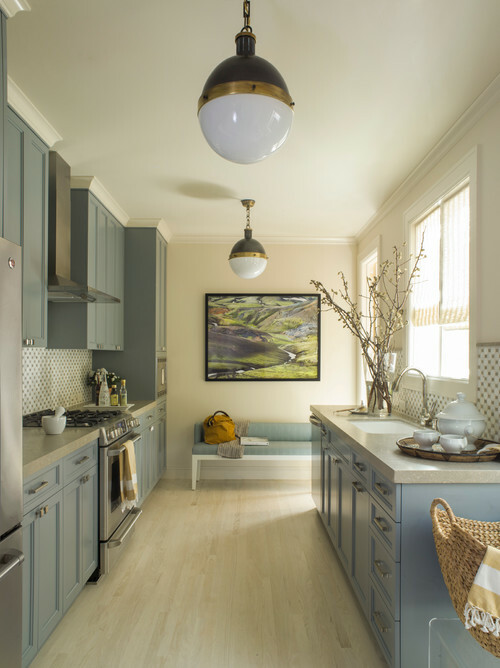 Photo by Bret Franks Construction, Inc.
Would you ever think to put a landscape painting in your kitchen? This one breaks up the expanse of wall at the end of the galley. 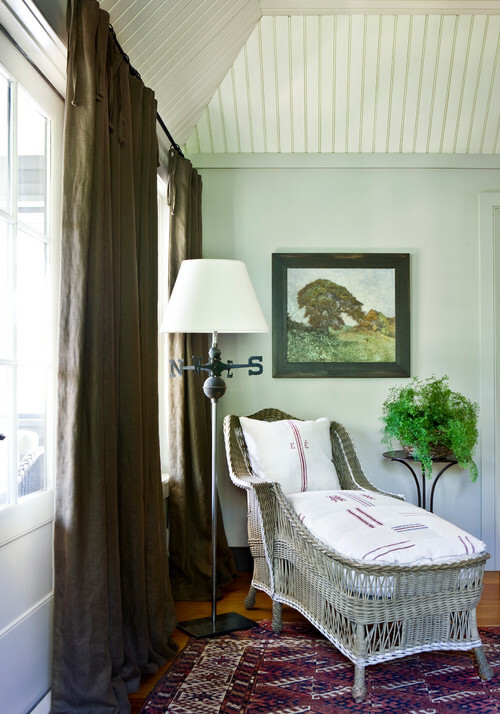 There’s so much I love about this cozy corner – the vintage wicker chaise, dark linen drapes, the weather vane lamp, the bead board ceiling, and of course the pretty artwork. 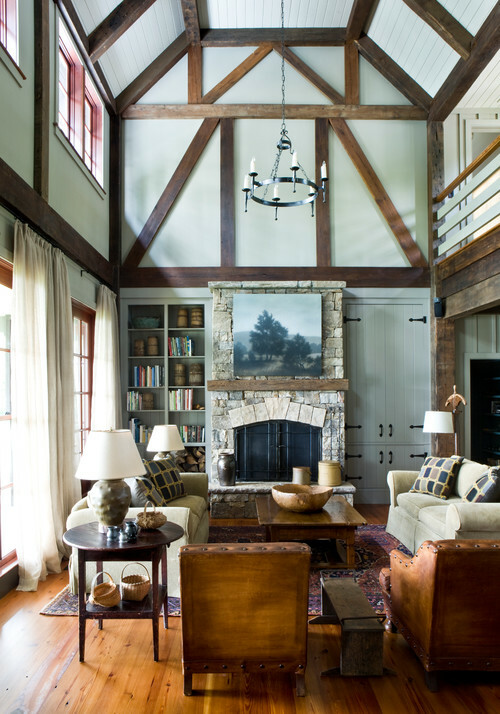 An amazing, rustic living room enjoys a pastoral scene placed above the mantel. Why stop at one landscape painting on the wall? 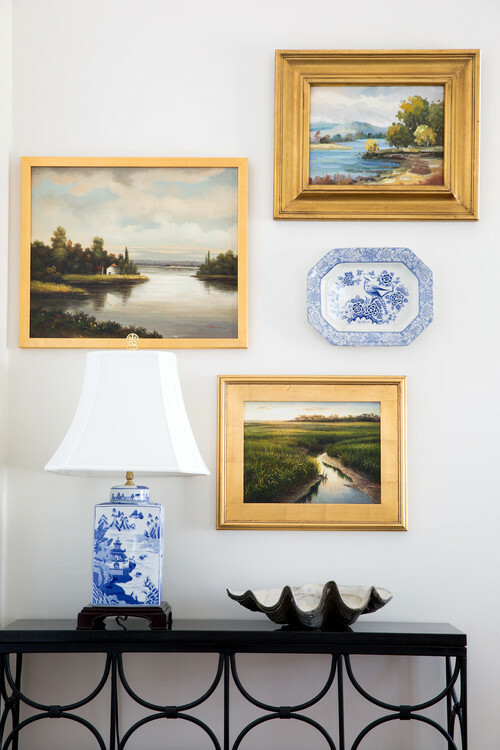 Here a trio of pictures share wall space with a blue flow China platter. 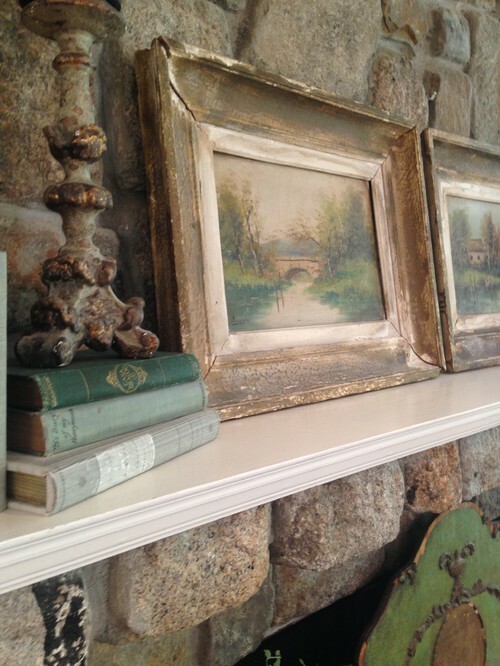 Rustic wood frames a pair of matching landscape oil paintings in soft tones. 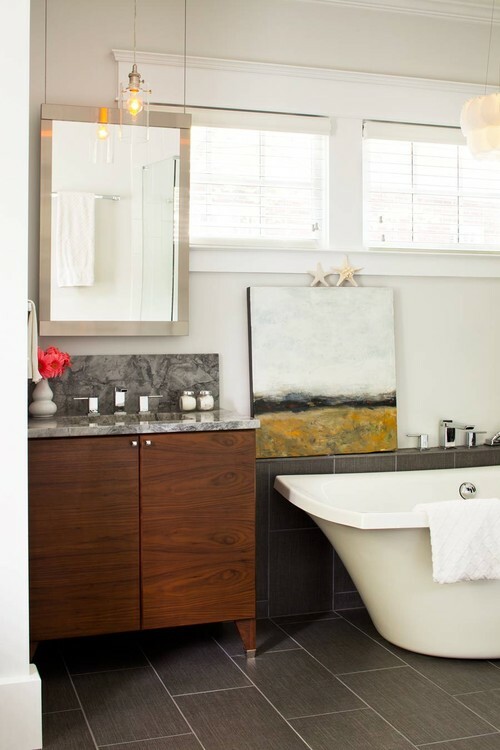 An abstract landscape canvas beautifies a pretty bathroom. And another bathroom has a small landscape painting. Photo by Jetton Construction, Inc.
Bedrooms make a great location for landscape artwork. Place a light above it for added dimension in the evening. 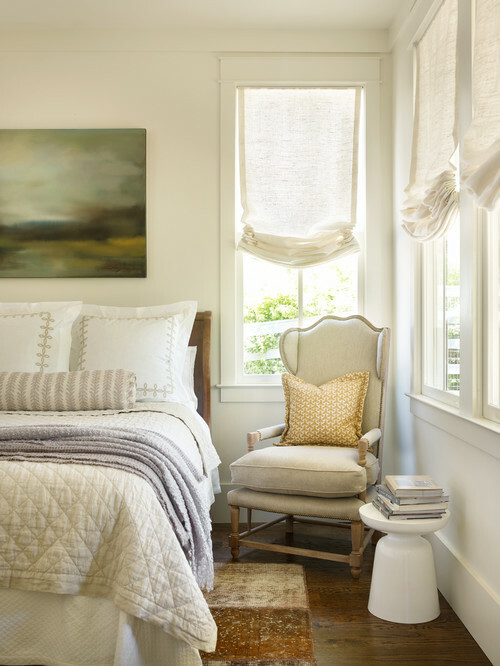 A muted landscape painting adds color to an almost all-white bedroom. The effect is serene and peaceful. And if you just can’t get enough of landscapes in your home, why not have a mural painted on the walls? So gorgeous and what a classic and timeless look. I’d love to have this dining room in my home. Photo by Sroka Design, Inc.
Do you have any landscape artwork in your home? Love the scenes. No, I do not have one but enjoy seeing them! Do you know Miss Mustard Seed blog? You have to sign up for her blog. She has recently hand painted a mural of such on her dinning room wall. I couldn’t find it to share but you will find it on her blog. Following is her site to recently painted furniture. She is continuing learn the art of painting. Marian is quite talented and blogs everyday! She is currently in Paris on vacation. Yes i have a few, some with old barns, cows, and fields of flowers. While I’m not big on landscapes, I do love seascapes, especially harbor scenes with well-worn rowboats tied to piers. Pretty specific, I know. Also, I know I’m in the minority when I say I like galley kitchens with nooks at the end for dining, rather than eat-in kitchens. I’ve always felt that many designers fail to utilize the blank wall at the end of a galley, so the one you’re featured in your post is amazing and I love it – with the calm cool colors and the serene landscape. Just beautiful. I was fortunate to receive two paintings as gifts from my husbands aunt in Taos – she used to sell her art in a gallery there and her work is lovely. One is in the living room and one in the dining room – both really help make the room – beautiful colors, the serene subjects and even the beautiful frames all draw the eye. Most of my decor is very simple, so I like the added appeal that an actual, real painting done well brings to the space. Yes, I have always been drawn to landscapes. They can be traditional or modern, I love any kind. What I really like is when I go thrifting I find some very nice paintings. I have them all over the house! This is the perfect look to blend rustic with modern interior decor and it came out great. Jennifer, Finally found the mural on the dinning room of Miss Mustard See.